This LED clock is cordless and portable. Can be set one very loud daily alarm and snooze function is available. Easy use and with big time display. Item size: 195x 57x 67mm. One year warranty of quality: If there is any problem of quality, please contact us for a replacement or full refund. 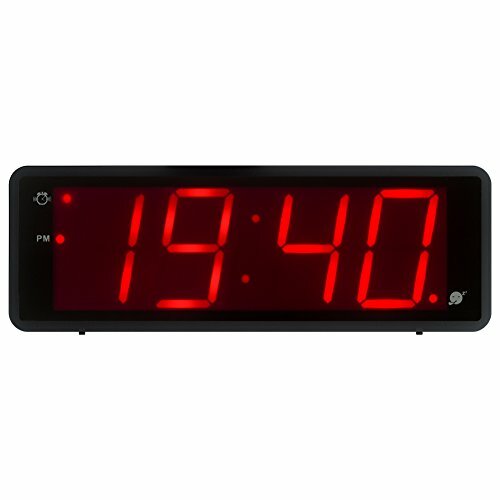 ★Large LED Time Display---The 1.8" 24hour light LED time display can let you check your time easily even in dark. ★Battery Operated Only---This digital clock is operated by 2 pcs D size alkaline battery only (not included). ★Ultra-low Power Consumption---2 pcs D size alkaline battery ((DURACELL) can keep this digital alarm clock keep working for more than 12 months. ★3 Levels of Brightness---There are 3 levels of brightness for your option, and the led alarm clock will enter into Night mode and dim automatically at 8:00pm~6:00am to make ensure you have a good sleep. ★1 Year Quality Warranty---If the clock has any quality problem within one year, you can contact us to get a replacement or a refund. If you have any questions about this product by Kwanwa, contact us by completing and submitting the form below. If you are looking for a specif part number, please include it with your message.